As well as an exciting host of local designers/makers at next weekends Orleans House and Home Fair there is also a jam packed programme of FREE events for the whole family. You’re invited to join the award winning Twickenham Operatic Society as they take you back to a time when hair was big, greed was good, collars were up, and a wedding singer might just be the coolest guy in the room. Why not try some singing this autumn? Richmond Community Choir’s new term starts on Thursday 12 September at Orleans Primary School at 6.30pm. We are a not for profit and very friendly Choir open to all who would like to sing. Our focus this term will be on our Christmas Concert in mid-December, and we rehearse every Thursday. The Environment Trust for Richmond upon Thames (ETRuT) have planned four exciting events for September and October. They are always fun and informative, so please sign up soon. Bonjour, Vous parlez un peu de français? Venez nous rejoindre! French conversation classes, every Friday 10:30 - 11:30am, restarting 6 September 2013, just a two minute walk from Richmond Bridge. 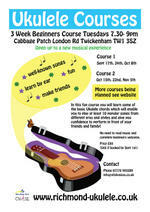 In this fun course you will learn some of the basic Ukulele chords which will enable you to play at least 10 popular songs from different eras and styles and give you confidence to perform in front of your friends and family. “The Freak Machine” is a new recording studio that has opened in Whitton just off the A316 by a long term St Margarets local, who previously worked in the Twickenham Film Studios for over 8 years.